Home » What is the Magna Carta? Since the time of Edward the Confessor in the 1000s AD, the kings of England had been getting more and more powerful. That was pretty much okay as long as the kings were good kings, like William the Conqueror or Henry II. But when King Richard died in 1199, his younger brother John became king, and John was not such a good king. King John didn’t seem to be taking such good care of England. First he lost almost all of the English land in France. Then he made everyone who owned land in England pay extra taxes. And he got into fights with the Pope about who would control the Catholic Church in England. King John’s fight with the Pope got so bad that the Pope excommunicated him (and then they made it up). So in 1215 AD the rich men of England – the earls, the dukes, and the counts – decided to try to get back some of the power from the king. They wrote a letter (Latin “carta”) saying that everyone in England would have certain rights, that the king could not take away from them anymore. 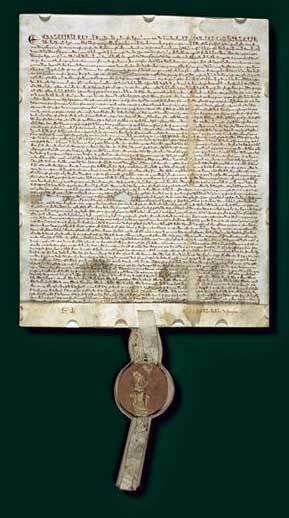 The Magna Carta (“the important letter”) insisted that even the king had to obey the law. This was not a new idea – Roman emperors were supposed to obey the law, and early medieval kings were elected by the rich men of their kingdom and could be removed if they behaved badly. But the kings were always trying to get more power, so the rich men needed to push back in order to keep their rights. Check out this great video about the Magna Carta! Most of the rules that the rich men wrote down in the Magna Carta aren’t laws anymore today. The most important rule that we do still use today is habeas corpus, which means “Do you have the body?” in Latin. This rule means that the government can’t keep people in jail secretly. The government has to tell the public if someone has been arrested or is being held for any reason. Habeas corpus protects people from being kidnapped by the government for no reason, or for bad reasons. The Magna Carta only protected the rights of rich men. But gradually even poor people demanded and got these rights too. Today habeas corpus is supposed to apply to everybody in England and the United States. Cite this page: Carr, K.E. What is the Magna Carta?. Quatr.us Study Guides, August 1, 2017. Web. April 24, 2019.